It has been a time since I last looked at the browser market figures, so I was still under the impression that Firefox had a market share somewhere in the 10 percent range. Well, that is not quite true any more, it’s more in the 25% range as I found out (via vecosys). These figures come from the XiTi Monitor, where figures per country can be found. 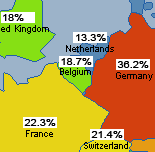 Now this reveals a very interesting fact: The Netherlands appears to have the absolute lowest market share for Firefox. Just 13.3% and decreasing (indeed, my ‘around ten percent‘ figure). At the same time, Germany (36%) and France (22%) are on the rise, and generally the new European countries have around the 30% penetration. What can be the cause of this relative low popularity of Firefox among the Dutch? We like to call our society an innovative one, and I like to see Firefox with its open platform as much more innovative than the competition. So what can be the explanation?